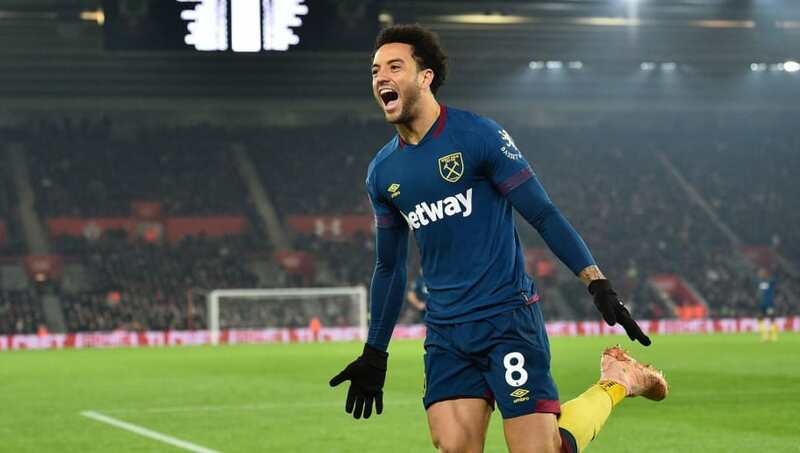 Felipe Anderson's double saw West Ham come from a goal down to beat Southampton on Thursday in a match full of highly controversial moments. ​Southampton started the match with vigour and promise, Nathan Redmond fired an effort straight at Lukasz Fabianksi beofre Danny Ings fired wide following a mazy run. ​West Ham, with ten first team players out injured, had Lucas Perez up front and the striker spurned the Hammers' best chance of the half on 22 minutes. Aaron Cresswell was played in down the right by Felipe Anderson and his cross found Perez, but the Spaniard horribly scuffed his shot wide of the post. The visitors grew into the game after Perez's miss and began to dominate proceedings, seeing most of the ball and appearing the likeliest to take the lead before the break. However, ​Southampton took the lead five minutes into the second half thanks to a hugely controversial goal by Nathan Redmond, as the winger appeared to punch the ball into the net after Fabianski had parried an Oriol Romeu shot. West Ham were sparked into life soon after, and got the equaliser three minutes later with Anderson firing a brilliant shot that flew past Alex McCarthy's near post from 25 yards. Felipe Anderson has scored as many PL goals (8) as all other Andersons put together (Man Utd's Brazilian 5, Viv 3, Stephan, Trond & Russell 0). They took the lead their performance deserved soon after with a swift counter-attacking move on the hour mark. West Ham broke, with Michail Antonio playing Anderson through on goal and the Brazilian made no mistake, firing high over McCarthy. However, just prior to Anderson's second, in another moment of controversy, Andy Carroll swiped at Romeu and was spared a booking, when either colour could have been brandished. Despite the host's efforts, West Ham controlled the remainder of the game comfortably and sealed a deserved win to spark wild scenes among the visiting supporters. There was plenty of controversy surrounding the second half of Thursday's clash at St. Mary's, both for and against Southampton. Ralph Hasenhuttl has revitalised the Saints of late, with back-to-back wins over Arsenal and Huddersfield, however will rue some crucial decisions going against them on the night. Granted, Redmond's opener was scored with his hands, but Andy Carroll could have easily seen red with the game level at 1-1. Furthermore, Rice clearly hauled down Bednarek in the box as Southampton had a corner, only for West Ham to break immediately and score at the opposite end. West Ham were deserved winners in the end, but Hassenhuttl will have plenty to talk about after. Southampton were not at their glittering best, but Armstrong at least got himself about and closed down, having a few efforts at goal and beginning to show why Southampton wanted to prize the player away from Celtic. The big Danish centre-half gave the ball away on a few occasions and looked shaky when coming up against the speed and pace of Anderson and Antonio. The defender has obvious aerial ability, and can be a threat in both boxes, but he seemed to struggle against the smaller, more technical players that West Ham possessed. The strength in depth of Manuel Pellegrini's side has been tested in recent weeks with West Ham's injury list into double figures during the busy Christmas schedule. That said ,their strong performance today will be hugely pleasing to the Chilean as his side performed valiantly without numerous key players. Felipe Anderson scored two more goals as he continues to shine in claret and blue, this despite having a poor first half. With players set to return for West Ham, the signs are positive going forward for the east London side. It's almost unfathomable to think the West Ham youngster is only 19 years old as he glides around the pitch with the confidence and demeanour of a player ten years his senior. In his position in front of the Hammers' back four, he chased down Southampton players, intercepted passes and distributed the ball with precision and speed with both feet. It comes as no surprise that he is currently caught up in a tug-of-war between England and Ireland over with nation to represent because he is, without question, a big, big talent. Subbed on 54 minutes for Andy Carroll, the youngster failed to impose himself on the game despite West Ham's dominance in the first half. The academy product is still a bright prospect and has given a good account of himself during what has been a breakthrough season for the 20-year-old. Southampton are at home again as they host champions Manchester City on Sunday looking to inflict a third straight league defeat on the Citizens. Meanwhile, West Ham travel north on Sunday to take on struggling Burnley at Turf Moor looking to secure consecutive ​Premier League away wins.